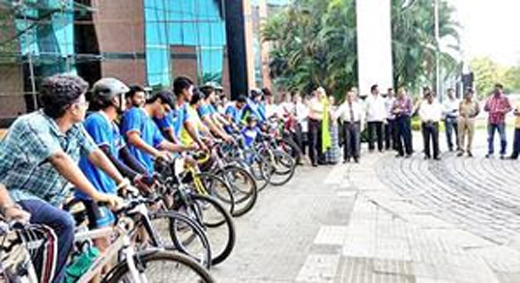 Manipal, Oct 10, 2016: Students, alumni and faculty of Manipal Education, successfully completed Tour de Manipal-Campus Connect Cycle Expedition from Manipal to Bengaluru in 48 hours on Oct 8, Saturday. In an attempt to highlight non-motorised transport in daily life, the expedition was planned by S.S.S. Shameem, Assistant Professor in Computer Applications with Manipal Institute of Technology. The team, comprising Shameem, K.Y. Arvind, Mayank Khanna, Alan D’Souza, Philip Adkins and Sagar, started from Manipal on Thursday evening after a formal flag off. At Mangaluru, members of the Mangalore Bicycle Club and the Mangalore Cycling Club joined the Manipal team and pedalled for some distance before seeing them off on Bengaluru highway. The Manipal team proceeded through Shiradi Ghat, crossed Hassan and reached Manipal Education’s Hebbal campus on Oct 8, Saturday evening covering a distance of 430 km. The tour had its earlier phase 1 wherein 12 MIT cyclists went from Manipal campus to Mangaluru campus and returned on October 2. The tour was a way of creating social awareness on eco-friendly means of transport and about health benefits of cycling. The idea was to encourage to students and others to take up cycling on regular basis while coaxing the interested to take it up as a sport.An avid cyclist himself, Shameem has inspired many people in Manipal in the past two years to take up cycling as a hobby and as a sport. The MIT/ Manipal University recently got its cycling team as well, which is very rare in engineering colleges, Shameem thanked the Manipal University for its support.